The current issue of the One Thimble Sewing E-Zine* has a gorgeous ‘desert in bloom’ kind of theme. And I love the way all of the PDF patterns in the current issue really showcase it. I designed the Coco Flower Crown pattern for this issue, and I really had a lot of fun stitching up little mini cactuses, succulents and flowers to be made into hair accessories. If you’d like to know more about One Thimble, or read more about the current issue, or my patterns, be sure to head over HERE and HERE. I was also really drawn to the Cactus Hoops Hexie Wall Art pattern designed by Rebecca from Hugs Are Fun. I’d always wanted to try making hexies! So when one of Issue 8’s contributors (Stephanie of ‘Swoodson Says’ fame) suggested a One Thimble pattern swap, I jumped at the chance. There are so many lovely patterns in the current issue, but I’m a sucker for crafty projects and hand stitching. So I knew straight away that I was going to make a cactus hexie hoop using Rebecca’s pattern. And it just so happened that she chose to try my Coco Crown pattern, so I can’t wait to see what she creates with it! 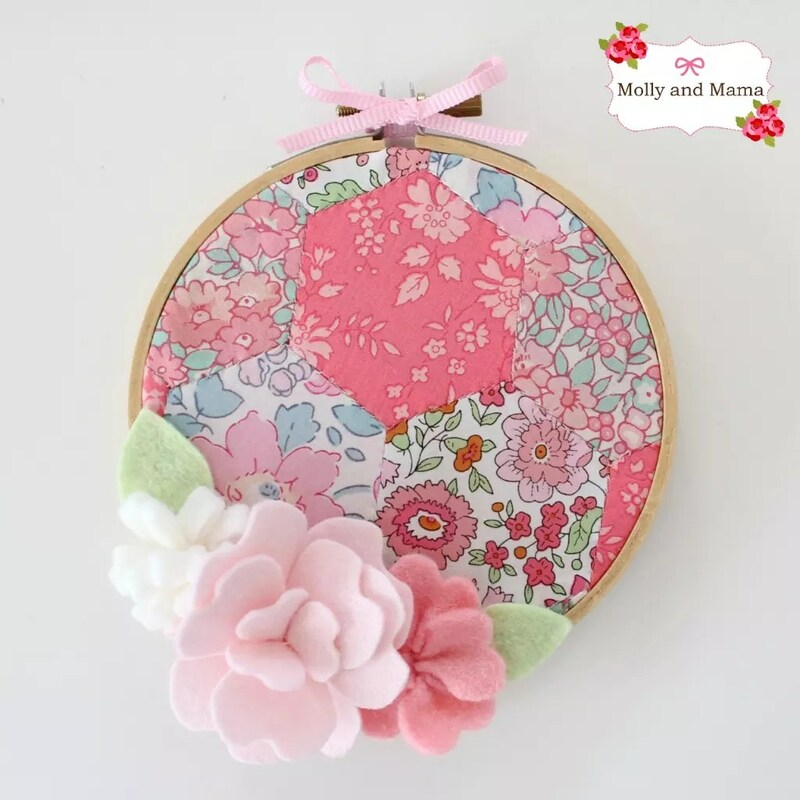 The ‘Cactus Hoops Hexie Wall Art pattern‘ describes how to create fabric hexies, join them together, and then frame them in a timber embroidery hoop. Then Rebecca provides instructions and templates to sew some pretty felt cactus flowers to go with it too. 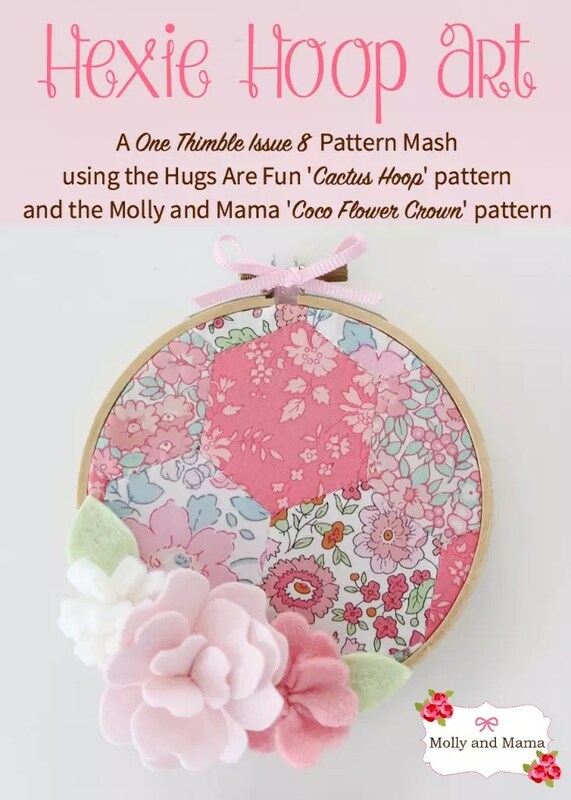 But seeing as I had already designed the ‘Coco Flower Crown’ for this issue, I thought it was a great opportunity to mash two patterns together, and use some of the flower templates in the pattern to create a 3D floral display to edge the hoop art with. I started the project by selecting my fabrics. 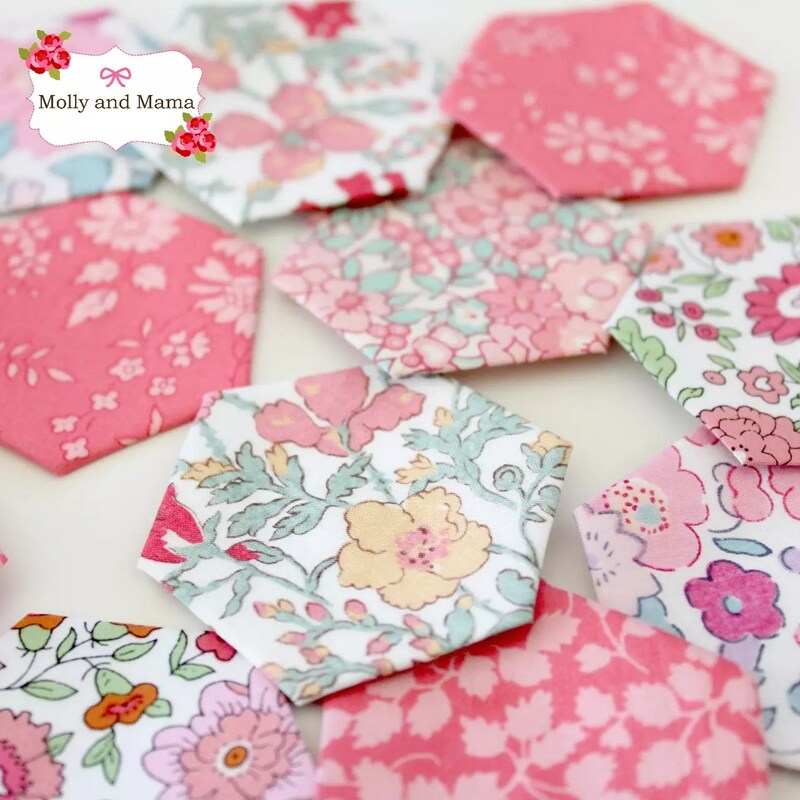 Hexies are fantastic because you can use up such a great collection of fabric scraps. I had a sweet stash of new and vintage Liberty pieces that were perfect! Rebecca’s instructions to create the hexies were simple to follow, so this part was a lot easier than I thought! 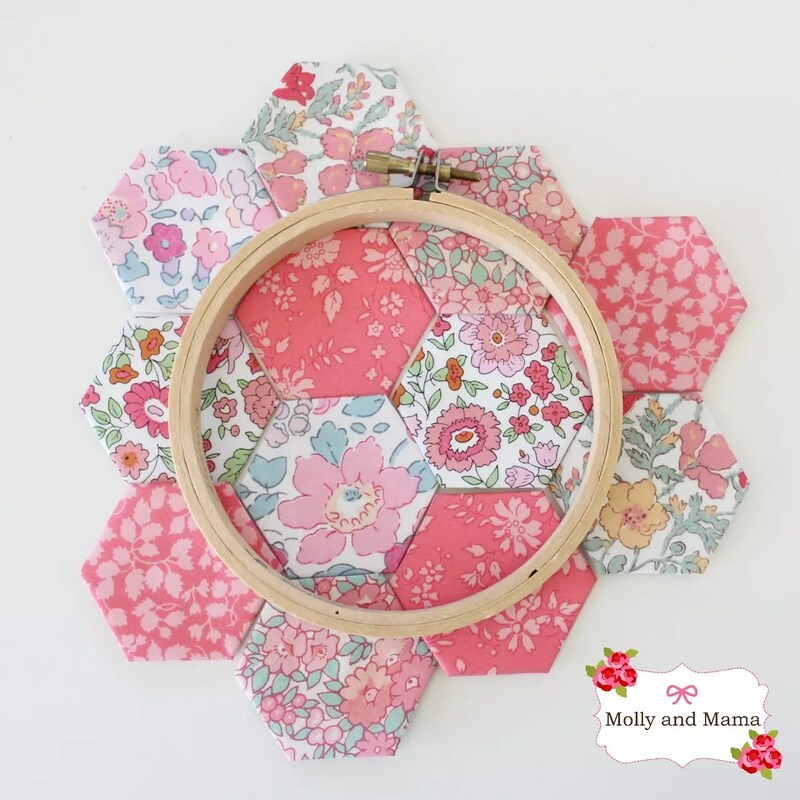 Because I was only using a four inch timber embroidery hoop, I worked out that I’d only need 12 hexies. I played around with the colours and patterns until I was happy with the layout. Then it was time to join them all together with some teeny tiny stitches. And then take out the paper templates. They fit in the hoop beautifully! Then it was just time to finish off the hoop using Rebecca’s instructions. All that was left was to add some pretty wool felt flowers. I used two of the templates provided in the Coco Flower Crown pattern to create the pink ones, and then I created a rolled felt strip with snips in it to make the white hooped flower. Two small leaves cut from felt scraps finished off the little collection. I used hot glue to secure them, then tied a bow at the top. Isn’t it sweet? This project was fast, and fun, easy to make and it will decorate my daughter’s wall beautifully. I can’t wait to make more for gifts! 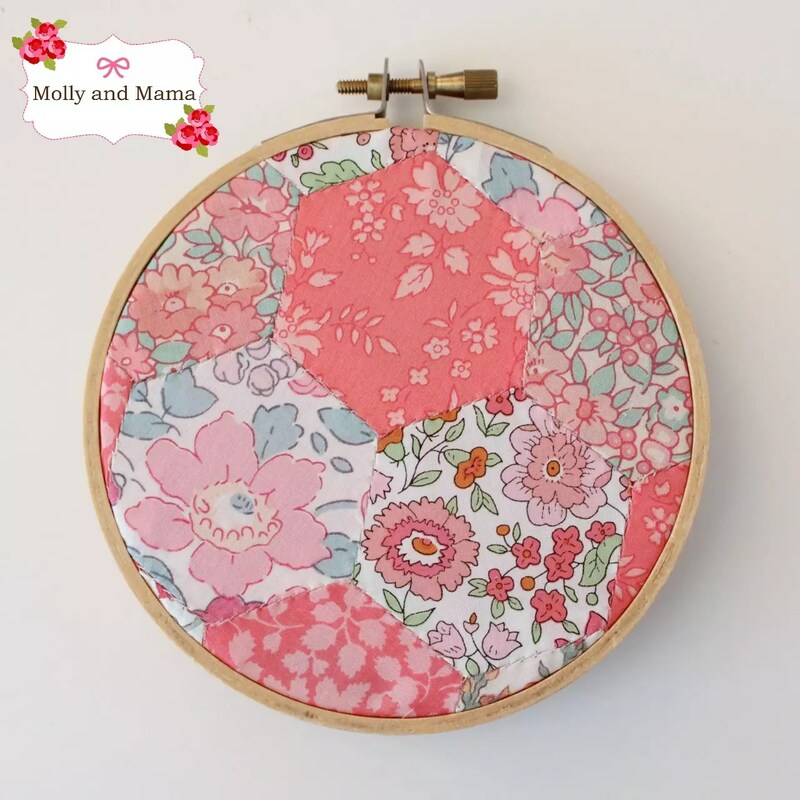 Would you like to see more patterns stitched up from Issue 8 of One thimble? 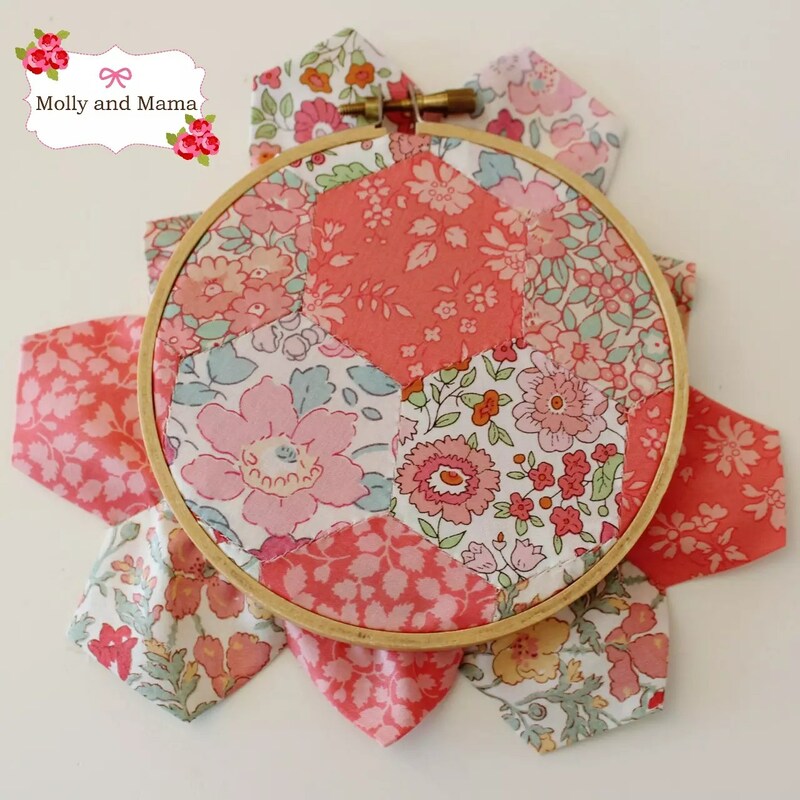 Follow the blogs below to see more gorgeous and inspiring ideas in this pattern swap! This is so pretty. I can’t wait to make one for my craft room.